The Ultimate Fence and Stop System for your miter gauge! Miter Guage Extension Fence provides support close to the blade to eliminate tear-out. 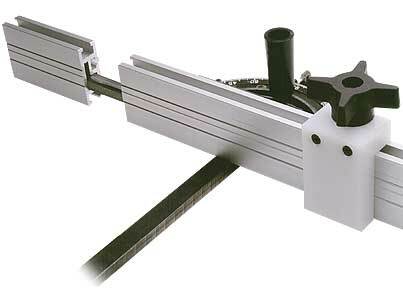 The adjustable, extruded aluminum fence increases the face of your miter gauge to 2-5/16" high x 22 long. 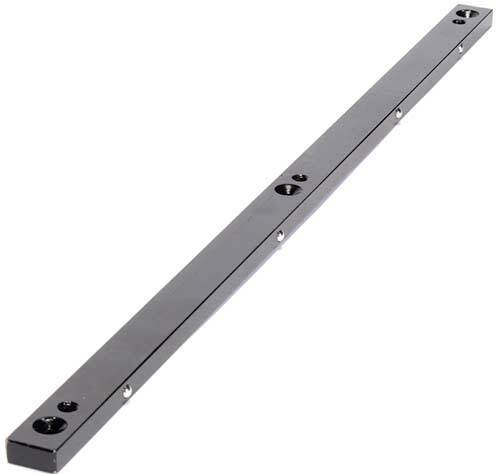 The built-in extension bar increases the stop capacity to 36". The included nylon stop adjusts along the full length of the fence, and locks tight for perfect repetitive cuts. Miter Gauge not included. Buy Both and SAVE $10! Includes #9458 amd #9467. Reg. Price $34.95. It's a great fence to add to your miter fence or crosscut sled. I like a flip stop instead of the fixed stop but it works. Additionally, you can get square steel stock from your local hardware store to give extra capacity if you need it. Lastly, I added sandpaper to the face of the fence to keep workpieces from moving (you can add that from your local hardware store - get stair runner non-slip and put that on). 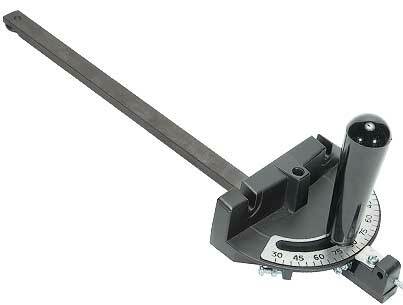 Our Miter Gauge features a full 60º travel both left and right with adjustable positive stops at both 90º and 45º. The 3/4" x 3/8" x 18" steel miter bar securely locks into a miter T-slot or will fit standard miter slots. Buy Both and SAVE $10! Includes #9458 and #9467. Reg. $34.95. I recently purchased this miter gauge and have been using it in my shop. The steel miter bar and heavy aluminum gauge are of good quality. The handle is plastic and threaded on the underside for attachment to the gauge. It did not take much use before the plastic threads began to give and I was no longer able to tighten the handle to hold the gauge in position. It's just crazy that they provided a handle with plastic threads for an otherwise quality device. For making crosscuts and routing end grain. Useful and accurate when making crosscuts or routing end grain on table saws. Squeezing the pistol grip engages a downward pressure clamp, securing your stock firmly in place. 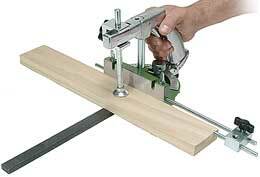 Fits any standard 3/4" x 3/8" miter slot. The positive adjustable stops at 90º and 45º, left and right, are useful for both left and right tilt table saws. Includes adjustable stop block, great for repetitive length cuts. 4" Maximum stock thickness. Bar extends to 12". Buy Both and SAVE $15! Includes #9456 amd #9467. Reg. Price $34.95. Upgrade your jigs and fixtures. Perfect for miter Gauges. Heavy Duty 18" precision miter bar is designed to fit standard 3/4" x 3/8" Miter Gauge slots. Adjustable spring loaded ball bearings allow you to adjust the fit for zero side to side movement. Great for jigs and fixtures. 3 threaded 1/4" holes and 3 through holes allow you to add this bar to almost anything. Allen key included. 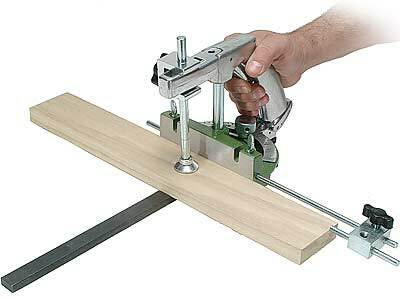 I just purchased two of these miter Bar's for a new Jig that I am building to use on my SawStop table saw. I used hardwood glides on my cross-cut sled, then I used an Incra Miter Bar for my Box jig. By far on my table saw these MLCS bars are the smoothest. The four spring loaded ball bearings do a very nice job of fitting the bar to the slot with out any grabbing. It is a very consistent glide for the entire run of the miter slot. Having the threaded holes as well as the through holes will make it easy to mount the bars to my jig.